Gil Elbaz’s new company plans to collect, organize and distribute every fact on the face of the earth (and, presumably, above and below it). His company was featured on the front page of today’s New York Times Sunday Business Section. The sum of human knowledge from a hundred years ago. Colin Macfarquhar’s old company dates back to about 1770, when Colin and partner Andrew Bell hired William Smelie to put together the first edition of the Encyclopaedia Britannica. Smelie was 28 years old at the time, and he managed to produce, with collaborators, over 2,500 pages in three volumes. This month, after 15 editions, and all sorts of contortionist moves to contain and present an increasing vast store of information, the old EB gave up. No more editions. They’re done. After more than 200 years of successful publication of facts in books, the task became overwhelming as the publication business was overwhelmed by the crowd sourced newcomer, not yet a decade old, called Wikipedia. And the old Britannica ceased publication. 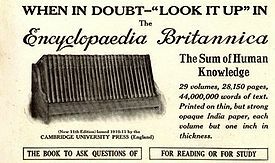 ‘Tis a sad day, I suppose, but neither the Encyclopedia Britannica, nor the World Book Encyclopedia (which was always easier to read and more enjoyable to browse because of its reliance upon pictures), nor Colliers or the others, were superior reference tools. William Smelie was responsible for the first Encyclopaedia Britannica, a stunning accomplishment that lasted centuries, but never overcame the digital revolution. Early in my career, I wrote and researched questions for television game shows, where a contestant’s knowledge (and memory) of facts could be converted into thousands of dollars. We kept several encyclopedias in the office. Each one had a pad above it, where writers and researchers made note of errors. Each pad was dozens of pages long. There were lots and lots of mistakes, some stunning in their stupidity: Paris was the capital of Egypt, that sort of thing, resulting from too many pages being pushed through a manual system at speeds that made sense only to a publisher. Gil Elbaz, founder of Factual. Geared to both big companies and smaller software developers, it includes available government data, terabytes of corporate data and information on 60 million places in 50 countries, each described by 17 to 40 attributes. Factual knows more than 800,000 restaurants in 30 different ways, including location, ownership and ratings by diners and health boards. It also contains information on half a billion Web pages, a list of America’s high schools and data on the offices, specialties and insurance preferences of 1.8 million United States health care professionals. There are also listings of 14,000 wine grape varietals, of military aircraft accidents from 1950 to 1974, and of body masses of major celebrities.